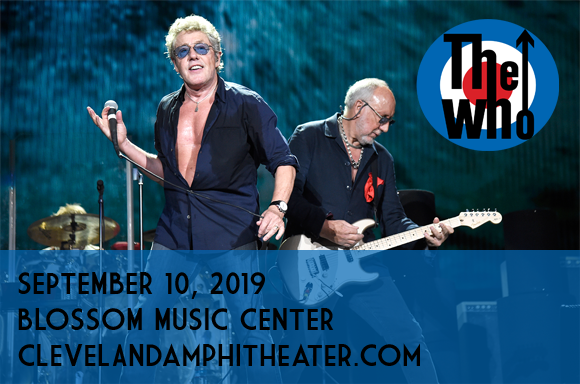 Regularly extolled as the greatest rock band of all time, The Who comes to Blossom Music Center on Tuesday 10th September 2019 on the Moving On! Symphony Tour! Not only will fans get a full rock and roll dose of The Who performing their raucous, classic hits live, but the band will be joined by a full symphony orchestra, taking these beloved songs to the next level! In addition, the legendary band will perform brand new material from their eagerly anticipated upcoming album – their first album of new material in 13 years! An unmissable show! Widely regarded as one of the most influential rock bands of the 20th century, English rock band The Who formed in London, England in 1964. Founded by Roger Daltrey (lead vocals), Pete Townshend (guitar, vocals) and John Entwistle (bass), the group evolved from a group called the Detours and was later joined by drummer Keith Moon, who completed their classic line-up. They released their debut single, "I Can't Explain", in 1964 and it proved to be the first of several Top Ten UK hit singles for the group, including "My Generation", "Substitute" and "Happy Jack". The group's first Top Ten hit in the US was 1967's "I Can See for Miles". In 1969, the band released Tommy – a rock opera album containing the single "Pinball Wizard", which was later adapted into a film, gaining cult status. The same was true for the band's 1973 album Quadrophenia, which was adapted for film in 1979. In 1978, not long after the release of Who Are You, the band's eighth studio album, Keith Moon passed away. Determined to carry on their legacy in his name, The Who hired Kenney Jones, previously of the Small Faces and the Faces. In 1983, the band parted ways, reforming for various one-off concerts over the years and returning to regular touring in 1999 with drummer Zak Starkey. In 2002, Entwhistle also passed away. Townshend and Daltrey continued to perform, with the blessing of Entwhistle's son, and released the album Endless Wire in 2006. The Who received a Lifetime Achievement Award from the British Phonographic Industry in 1988 and from the Grammy Foundation in 2001. The band has been inducted into the Rock and Roll Hall of Fame and the UK Music Hall of Fame, with two of their albums (Tommy and Who's Next) and the single "My Generation" making it into the Grammy Hall of Fame. Pete Townshend and Roger Daltrey received Kennedy Center Honors as members of The Who in 2008.